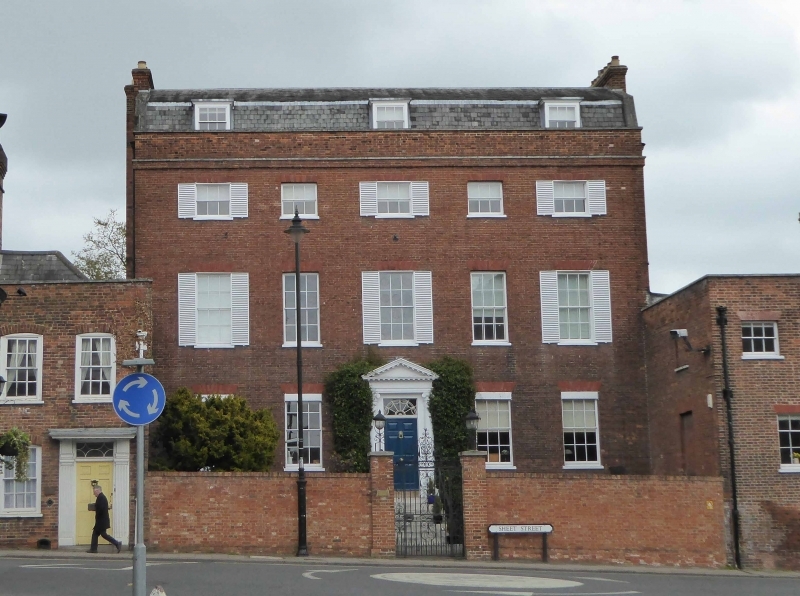 Late C18, 3 storeys, attic and basement, dark red brick on projecting basement, and projecting 3 course band over the 2nd floor windows crowned by 1 course of stone, plain parapet with stone coping and mansard roof of small slates, flanking chimneys. There are 3 dormer windows in the attic with architrave frames and small cornices, 5 square windows on the 2nd floor and 5 windows on the 1st floor. The 1st, 3rd and 5th window on these floors has a pair of Venetian shutters. On the ground floor there are 4 windows with plain scolloped blind cases, and a 6 panelled central door with a rectangular fanlight over, concentric, radiating and wreathed glazing pattern enriched with cast lead ornament. The doorcase has a plain outer surround with entablature, engaged Ionic columns, entablature with modillioned cornice and pediment, 8 stone steps with plain wrought iron handrails. The house is set back from the road and has a brick wall with central gateway with brick piers, stone capping and contemporary wrought iron lamp holders. The wrought iron gate is described by Strakie Gardner on page 188. (English Ironwork of the XVIlth and XVIIIth Centuries). There is a wing to the right hand 2 storeys, brick, parapet with stone coping, 2 windows on the 1st floor and 1 window on the ground floor. Interior retaining good original features, open string staircase, cornices, doorcases, dado panelling and fireplaces. Nos 17 and 19 are designed as group.